Be good to your belly, with GoodBelly! Enjoy this delicious beverage morning, noon or night to improve digestive health in your gut with live and active probiotic cultures. Did you know 70% of your immune system lives in your gut? All the more reason to treat it well. 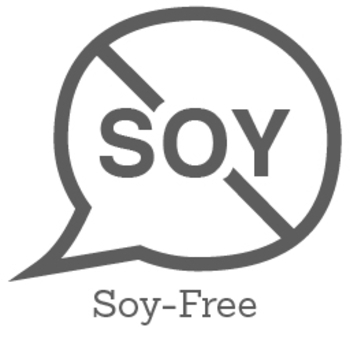 The exclusive probiotic in GoodBelly, called Lactobacillus plantarum 299V (LP299V), is great for all kinds of reasons. 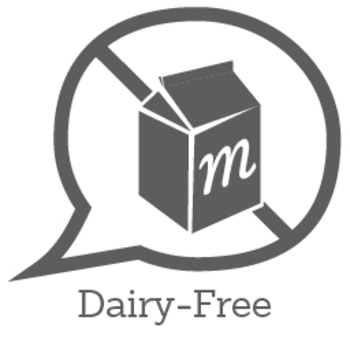 Plus, it does its job without dairy — which makes it a great choice for even more people! Filtered Water, Organic Pear Juice from Concentrate, Organic Evaported Cane Sugar, Organic Blueberry Juice from Concentrate, Organic Oat Flour (2% or less), Organic Acai Puree, Organic Flavor, Natural Flavor, Calcium Citrate, Citric Acid, Fruit and Vegetable Juice (for color), Organic Barley Malt, Lactobacillus Plantarum 299V. Filtered Water, Organic Grape Juice from Concentrate, Organic Evaporated Cane Sugar, Organic Pear Juice from Concentrate, Organic Strawberry Juice from Concentrate (2% or less), Organic Cranberry Juice from Concentrate, Organic Oat Flour, Organic Watermelon Juice from Concentrate, Citric Acid, Natural Flavor, Organic Guar Gum, Organic Barley Malt, Vegetable Juice (for colour), Lactobacillus Plantarum 299V. Filtered Water, Organic Pear Juice from Concentrate, Organic Mango Puree, Organic Evaporated Cane Sugar, Organic Banana Puree, Organic Oat Flour (2% or less), Organic Flavours, Natural Flavor, Citric Acid, Organic Barley Malt, Organic Guar Gum, Lactobacillus Plantarum 299V. Filtered Water, Organic Pear Juice from Concentrate, Organic Blackberry Juice from Concentrate, Organic Evaporated Cane Sugar, Organic Pomegranate Juice from Concentrate, Organic Oat Flour (2% or less), Natural Flavors, Vegetable Juice (for color), Citric Acid, Organic Barley Malt, Lactobacillus Plantarum 299V. Filtered Water, Organic Pear Juice from Concentrate, Organic Mango Puree, Organic Banana Puree, Organic Evaporated Cane Sugar, Organic Oat Flour, Natural Flavors (2% or less), Organic Spirulina, Organic Flavors, Citric Acid, Organic Chlorella, Organic Guar Gum, Organic Barley Malt, Organic Spinach, Organic Alfalfa Grass, Organic Oat Grass, Organic Parsley, Ascorbic Acid (Vitamin C), Lactobacillus Plantarum 299V, Organic Reb A (Stevia Leaf Extract). Filtered Water, Orange Juice from Concentrate, Organic Pear Juice from Concentrate, Organic Evaporated Cane Sugar, Passionfruit Juice from Concentrate, Organic Banana Puree, Gluten-Free Oat Flour (2% or less), Natural Flavors, Citric Acid, Fruit and Vegetable Juice (for color), Organic Guar Gum, Ascorbic Acid (Vitamin C), Lactobacillus Plantarum 299V. Coconut Water from Concentrate, Organic Grape Juice from Concentrate, Filtered Water, Gluten-Free Oat Flour (2% or less), Lactic Acid, Lactobacillus Plantarum 299V, Reb A (Stevia Leaf Extract). These are delicious all flavors are tasty,healthy and great tasting refreshing and no artificial sweeteners,I highly recommended this product organic and delicious. It is a healthy option, although I do prefer drinking Kombucha. I found this product very hard to find in upstate new york. The Blueberry acai flavor is the best. I lobe the taste of this juice. Not sure if did much for my belly or if it was suppose to but it taste great. I ended up purchasing another one because my kids also loved it. My family and I loved the Blueberry Acai flavor! It is a tasty way to get probiotics! We enjoy our glass in the morning with breakfast to start your day! 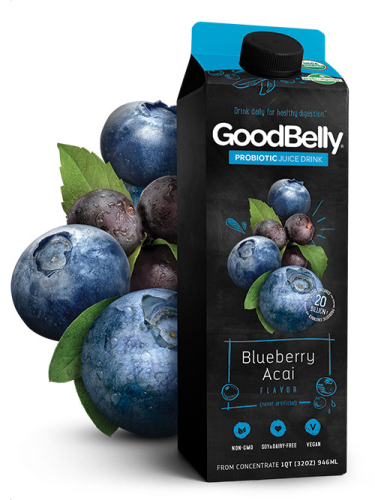 The GoodBelly Probiotic Juice Drink is an organic, gluten and dairy and soy free drink of pure goodness. I enjoyed the GoodBelly Probiotic Juice in cranberry for it's beneficial gut properties.